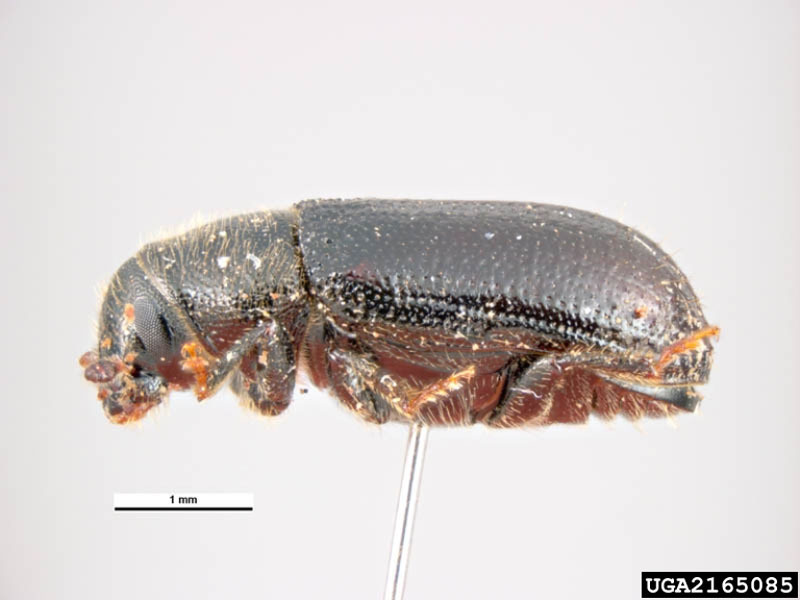 Most of the damage caused by these small beetles (adult insects are 3 mm to 5 mm long) is attributable to adult insects, although the larvae feed in tunnels burrowed beneath the bark by the females to lay their eggs. These tunnels, which can be up to 25 cm in length and are called maternal, larval tunnels, are found more often on surfaces exposed to the sun and mostly on weakened or partially withered trees. 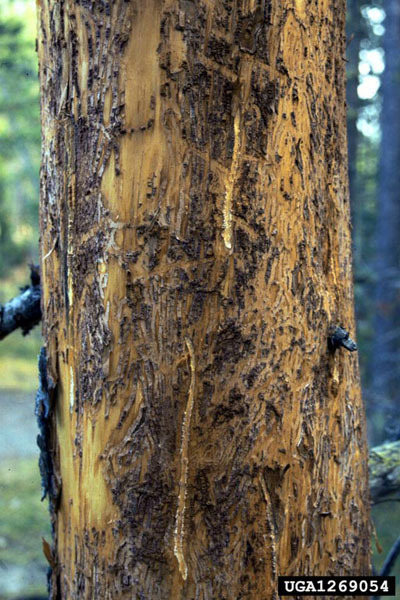 They damage the living parts of the bark and block sap flow. They also promote the penetration of fungi, which cause bluing of the wood. Adults emerge from the tunnels by boring holes through the bark. They take flight and attack terminal and lateral shoots growing on pines of all ages. They penetrate inside these new shoots and burrow as far as 10 cm into the pith. Young adults are brownish black in colour and become darker over time. The most significant damage occurs during the insect maturing period from July to October. Damage to the shoots is usually limited to the upper third ot the crown. Infested shoots shrivel, begin to turn yellow, then red, and finally break near the entry hole dug by the beetle. Signs of the insects’ presence are bent, yellow and red shoots; dead shoots on the ground from previous years with pith removed; presence of boring dust (frass) on stems; tunnels between 2 cm and 10 cm in length dug inside shoots; and resin exudations at the entry of holes dug by the insects. In the case of a major infestation, growth in height and diameter as well as wood quality are compromised. 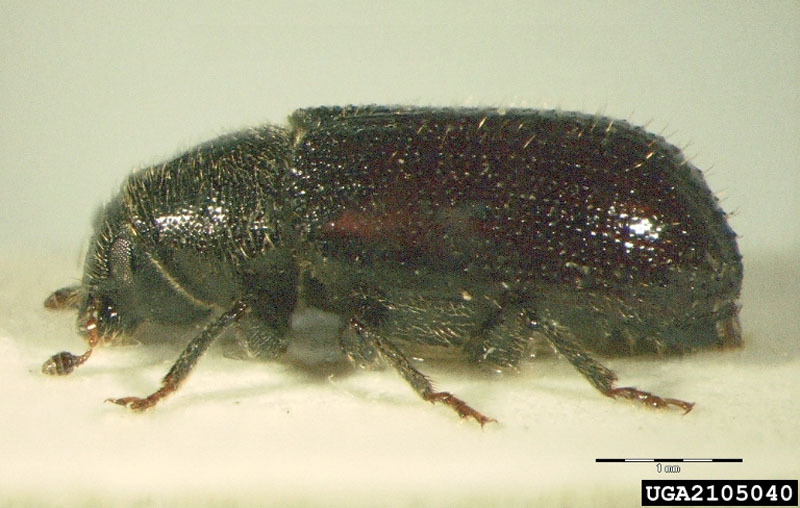 Originating in Europe, North Africa and Asia, pine shoot beetles are a fearsome pest found in over 14 American states. They were detected in Ontario in 1993 and in Quebec in 1998. 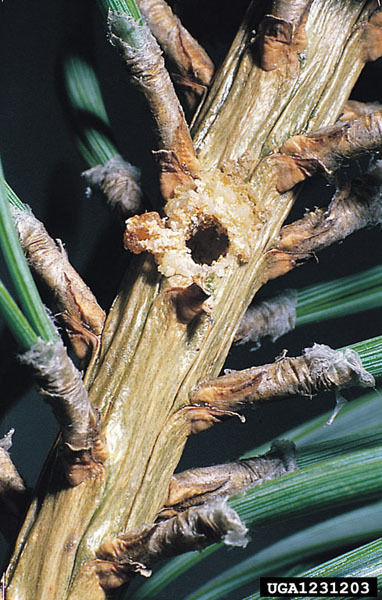 They are closely monitored and some regions have been placed under quarantine, perhaps because in Europe, the pest causes severe damage to several pine species. In North America, the worst damage has been reported in commercial Scots pine plantations, particularly poorly maintained plantations. They pose a threat to huge volumes of standing timber (an estimated 927 million m³) in eastern Canada because of their potential to damage plantations of jack pine, red pine, white pine, Scots pine and Laurentian Shield jack pine. 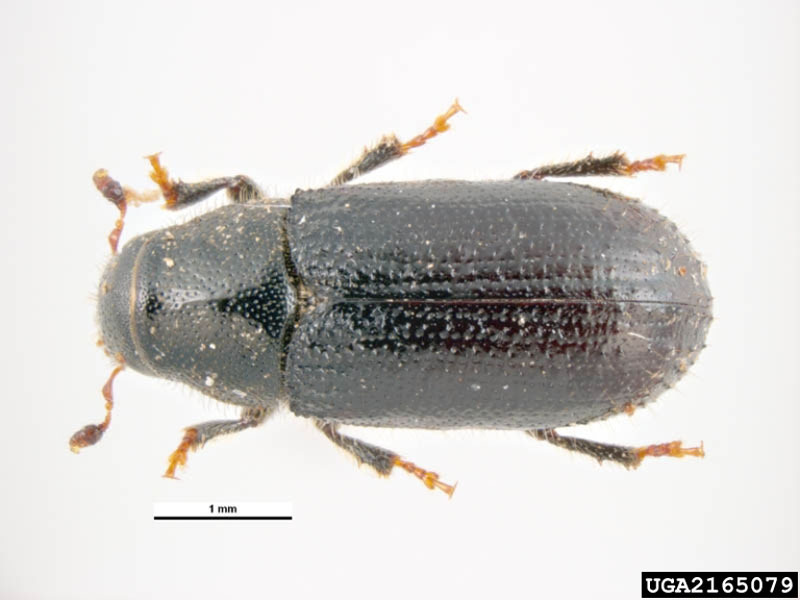 Because of the threat pine shoot beetles pose throughout the region, various methods have been implemented to halt their spread, in addition to strict regulations on the importing of forest products. Traps can be used to detect pine shoot beetles and limit their infestation of some stands. Another technique is to arrange pine logs on the ground, which serve as bait and are colonized by adult insects. The logs are then destroyed.